Note: this entry is from last Spring. I’m reposting it here because the content still seems relevant to me. 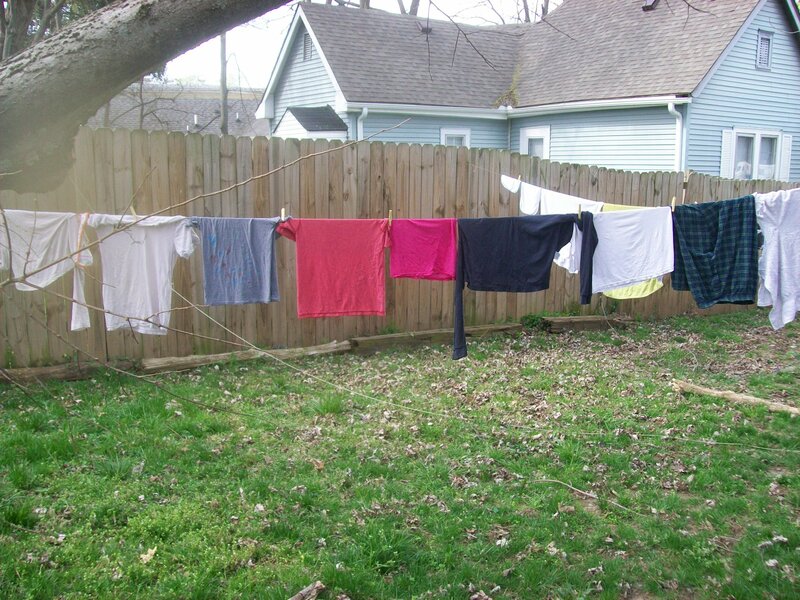 When we moved into our house, there were clotheslines in the backyard already here and all set up, so I said that I’d hang out clothes to dry all the time. However, as of a year and a half in our house, I’d hung out the clothes to dry exactly zero times. See, there are a lot of good reasons to dry clothes outside. It saves money and electricity, and it’s good for the environment and for your clothes. The only reason to not do it really is that I’m lazy and that is the reason that won out. The gauntlet was laid down and I had no choice but to either hang something or call someone. The jig was up for laziness. 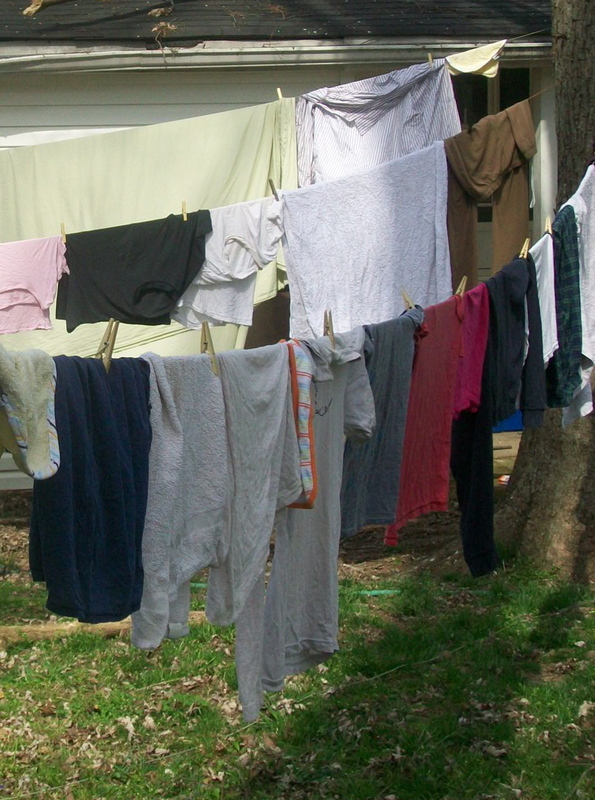 The next day happened to be the perfect clothes drying weather – breezy, warm, and dry, and we had a few clothes pins leftover that I’d used to hold up party decorations sometime last year, so the baby napped, and I hang out clothes. 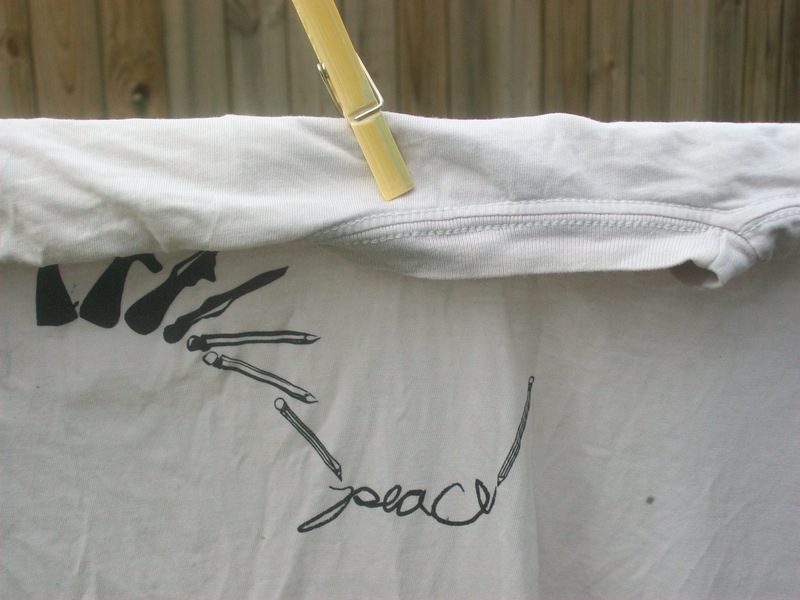 Well actually, first I went to the internet and googled, ‘how to use a clothesline,’ because I wanted to do it just right so the clothes dried well and didn’t overlap too much and hung correctly and I read a thousand very detailed, long instructions, which basically all summed up said, ‘Just put the clothes on the line, idiot. You’ll be fine.” And I was. In fact, I’ve done it again a couple more times and really love it. First, it is so relaxing. It feels so calming and historic and simple. Turns out, clothes hanging though a totally plain, ordinary practice is somehow meditative or, at least, causes me to notice the breeze, the sun, and the texture of the day. Also, it makes your clothes smell amazing. I can’t explain how this happens, but when Jonathan and I wrapped up in the sheets that night, they smelled like a mix of springtime grass, sunshine, and slowness. I also love how the clothes feel all crinkly. I saw in my research that this bugged some people, but I liked it. All in all, I’m glad our dryer broke. It forced me to do something that yielded more than convenience can–a little bit of peace and beauty in the day. And it saved electricity, which hopefully contributes in the most minute of minute ways to peace on a grander scale. After I finished, the baby woke up and I took off her clothes (because our crunchy earthy doctor told us that sun and air are the best cure for diaper rash) and my naked baby and I laid on a blanket on the grass and had a lovely time playing in the sun as the clothes dried and imagining that we lived in the 1800′s.